My guest on this podcast is Joe Robinet, a name that will be familiar to listeners who spend time watching bushcraft and camping videos on YouTube. 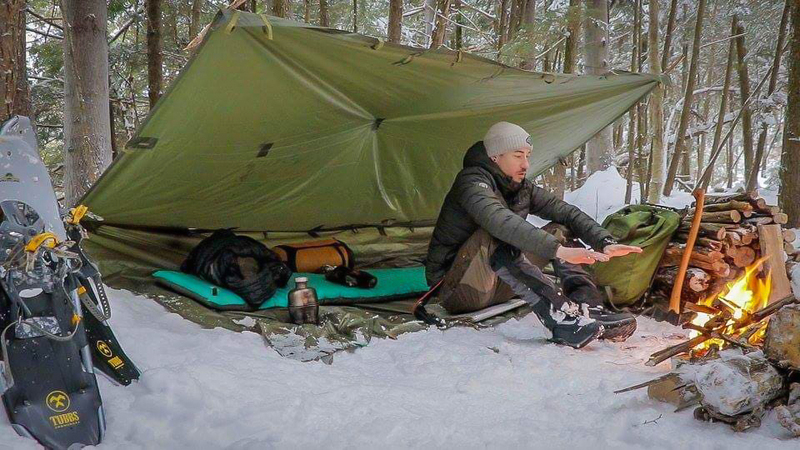 Joe has built a large following on YouTube publishing videos that document his outdoor life. At the time of recording this podcast his subscriber base was just over 500,000. In recent years I’ve been intrigued by the proliferation of outdoor video blogs and specifically bushcraft and camping videos on YouTube. So, I thought given Joe’s success on the platform, he would be a good person to have a conversation with to explore this phenomena in more detail. From filming and editing videos for YouTube and my blog, I know that it’s quite a time consuming process and I wanted to find out more about Joe’s motivations for making videos regularly as well as how he manages to juggle his outdoor life with the demands and constraints of filming. I know this was something a fair few listeners were also interested in, particularly those who have their own YouTube channels. Via my Facebook page I asked for listener questions to put to Joe and I received a considerable response. We cover these questions throughout this episode. Some lead to more in-depth discussions including a candid conversation with Joe around his experiences being on the first season of the History Channel series, Alone. Hi Praise indeed Steve. Thank you. Thanks for your question and your interest in this podcast. I am a seventy two year old man who has enjoyed camping and canoe camping since the early years of my youth. I have enjoyed the outdoors, Mother Nature, in all her moods… winter and summer and learned my skills at the knee of parents, grand parents and knowledgeable Scout leaders. Much of my canoeing skills I will credit to Bill Mason, his books and films. I have enjoyed many Ray Mears films which led me to finding both, you Paul and Joe Robinet. I enjoy and continue to follow you both because neither of you are preachy zealots. I find it quite interesting (this bears out your Zen quote “everyone you meet has something to teach you”, the gist of it anyway) that while I have many trips and years of experience under my belt, there is still much to learn. Your combined videos confirm many of my approach/techniques and yet still present ways of doing things that appeal to me. Things I will adapt to upcoming canoe trips. Thank you Paul and Joe for sharing your videos and knowledge, I for one, appreciate it very much. Thank you for your kind words Tim. I really appreciate them and your interest in what I do. I’m sure Joe would feel the same too. Enjoyed the “down to earthness” of this podcast. Nice one. Glad you liked it David. Hi Mickey, thanks for your comments. So glad you enjoyed the podcast. Cheers! Hi Paul, this was a brilliant blog. I follow Joe on youtube, it was great to listen to the two of you chatting about so many interesting and varied topics. Thanks for sharing this. As always, it’s good to hear from you. I’m glad you enjoyed the two of us chatting about various topics. My favourite episode to date Paul around my house Friday is Bushcraft Friday. That’s the day Joe and Shawn upload their videos. Maybe you could do a episode with Mors and the guys from Karamat. I’m aiming for a consistent Thursday release for these going forwards. Episode 63 is not on this site yet as I’ve just done a big server migration and had to hold off on making any changes to the site. It will be here over the weekend though. As for future podcast guests, yes I agree it would be great to have Mors on. Thanks for your feedback on this podcast and the podcast with Kevin. Both Joe and Kevin are genuine guys with a passion for what they do. Thank you Paul and Joe for such a warm conversation full of information and good stories. This is the first Paul Kirtley podcast featuring a guest I follow on youtube enthusiastically. Joe is a savvy outdoorsman. He is a relaxed and humble chap, and his work inspires me deeply. I’m glad you liked this Hernán and I hope it brought some extra insight into someone you follow already. Thoroughly enjoyed listening to this Paul, thanks for taking the time to record it (and Joe!). Just commenting on here as I don’t usually subscribe to podcasts but watch you both on you tube. All the best. Our pleasure Ian. Glad you enjoyed it. No worries if you don’t subscribe. I appreciate you taking the time to comment. When I got properly interested in finding out more about the skill sets and ideals of “Bushcraft” I looked on line at various Youtube videos. It soon became apparent that some people might “talk the talk”, but clearly had no idea about walking any sort of walk, especially if it involved in the woods and outdoors! Ask Paul Kirtley, Joe Robinet and Frontier Bushcraft VLOGs were outstanding in their content, explaining the content and, more importantly for me, were authentic and consistent in the messages they wanted to get over. I’ve learned so much, had my mind and horizons widened so much by all three I am genuinely surprised about how much I’ve discovered about outdoors and myself. Even a couple of hours walk with my dog has become a learning experience. Some of this sounds a bit over the top admittedly, but I am genuine about the sentiments! Thanks to all of you for your efforts and experiences. Hi Stephen, as always it’s good to hear from you. I’m happy to hear you liked this podcast and it integrated well with your other learning experiences in the world of bushcraft. I really appreciate all the positive sentiments in your post. Your enthusiasm and positivity around learning about nature and bushcraft are palpable. Professional meets Celebrity, worlds collide in a no holds barred Bushcraft Battle… in all seriousness though, a great interview that came across as more fireside conversation than Q&A. I’ve watched Joe’s channel off and on and it was interesting to hear about his background, the “Alone” experience and especially the challenges of filming. Thanks for all of the varied content on these podcasts. Hey Alex, good to hear from you and I appreciate your comments on this episode. I’m particularly glad you like the variety of the Paul Kirtley Podcasts. This was a great podcast. SO many great points. I really appreciate it. Thanks! Thanks Matej, I’m happy you liked it so much. Bravo Zulu as we say in the Navy on this podcast! Joe is at a disadvantage on his canoe trips due to lack of distilleries. You and Joe are the two regular channels I watch on youtube. Great stuff I like the term Woodsman. Hi Paul, really enjoy listening to these podcasts , this was one of my favorites , Joe Robinet is a great guy and i always like watching his videos . It’s good to hear from you again. Thanks for your feedback – I’m glad you enjoyed this podcast. I have since checked several of the podcasts which has then led to me watching Kevin’s youtube account of your trip together down the Spey. I look forward to future episodes. Thanks Paul! Hi James and welcome. Thanks for your comments – I was happy to read you enjoyed this chat with Joe. I hope you enjoy future episodes of the Paul Kirtley Podcast. Keep in touch and let me know your thoughts. Very interesting podcast. Really enjoyed listening to it while doing what I enjoy the least – cleaning. In exchange let me lift the secret of the three shells for you. It’s a reference to Demolition Man, a Stallone movie. Thank you Chris. I’m glad you posted this here. I’m sure I wasn’t the only one scratching their head. I’m normally pretty good with movie references, though. Unfortunately I’ve never seen Demolition Man, so it completely passed me by. What a treat! You and Joe Robinet on the same podcast. What I enjoy about Bushcrafting YouTubers is that there isn’t the network competition, manufactured or real, of television series. I can watch an ‘Ask Paul Kirtley’ episode, and once finished, watch Joe Robinet. The shout outs and recommendations to watch another’s channel is something that is virtually nonexistent on television. The international camaraderie is a pleasure to experience. Thank you for all that you do, Paul. Hi Mark, good to hear you enjoyed this podcast. You make a good point regarding YouTube vs TV. It’s a comparison I’ve not thought of before but you are right, the shout outs, recommendations and cooperation is very healthy. This was my 1st podcast ever! I enjoyed it! Love watching Joe’s videos… I’m also sub’d to ur Utube channel too, which is how I found this. Thank you both for sharing what u’ve learned!! Hi Priscilla, congrats on your first podcast! 🙂 I’m very happy you enjoyed it. Thanks also for subscribing to my YouTube channel. Fantastic pod cast with Joe, between You, joe, and Mr mears you have got me totally absorbed into bushcraft and find myself daydreaming whilst at work on where and when I can get out next! The interview was hilarious and insightful and answered a few questions quite personally. Well done and can’t wait to hear more and maybe see a vid of the 2 of you on that dock !???? Thanks for your comments. I’m glad to read you are so enthused about bushcraft! Unfortunately, Joe and I were not able to meet in Canada this time around. The logistics didn’t work out. I’m sure there will be another opportunity, though. In the meantime, there is much for you to absorb on this site and I hope you’ll get in touch if you have questions. A great interview Paul, it was nice relaxed discussion between yourselves, I’ve only recently subscribed to your YouTube channel, I like the updates I receive in my mailbox, there’s always something interesting your sharing, I enjoy your channel very much, I hope you manage to meet Joe and maybe do something together it would be great …. Hi Glenn and welcome. I’m glad you liked this interview and that you have also found my site in general. I hope you find many useful things here. Thank you very much for the great interview and to Joe Robinet. I just recently leaned about you Paul, from the YouTube channel Woods walker 1965. He is a small channel with a few thousand subs. I look forward to checking out your videos and further podcasts. Being from Canada I look forward to your interviews with Kevin Callan and beyond.